★QUICK FILL AND SELF SEALING - You can fill 100pcs water balloons quickly in less than 60 seconds by connecting to a water supply. You don\'t have to tie them off one by one after filling them up because these magic water balloons are auto-seal. Having self-sealing water balloons can save much time to prepare funny summer party toys. Kids can make Chirdren\'s self-help toy easily and have funny with their friends and neighbor. 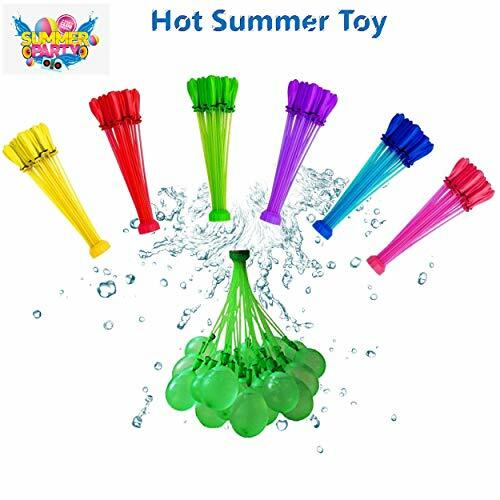 ★POPULAR SUMMER TOYS - Let these cute water balloons take you into a cool and happy summer, they can bring you and your family happy hours in swimming pools, outdoor parties, especially that chirldren can play more closely with parents, neighbors and friends. Self-sealing water balloons are perfect party toys for boys and girls to build close friendship together and enjoy making lovely friends! ★CONVENIENT ACCESSORIES AND PACKAGE- water ballons * 6 bunches (total 222pcs, 6 different colors), connectors * 2. Convenient connectors can help to fill up water balloons quickly. Small carton size and light weight are easy for you to carry to outdoor, beach, travel and anywhere. ★Healthy AND MULTICOLOR Balloons - The multicolor water balloons are made of 100% biodegradable natural latex, no odor or no chemically powdered coatings, to keep your family and friends safe.You can also give watter balloons to your friends as nice gifts. They naturally decompose to make the earth green. Total 6 different colors to decorate summer parties, swimming pools colorful and bring funny when playing games. ★SATISFACTION GUARANTEE: We are always doing our best to satisfy our customers, but if you get any problems or not satisfied with our Drain Opener Drain Clean Stick, please feel free to contact us for support, we will exchange it for free for you or you can get a full refund. we guarantee that you will not lose money for buying our products.